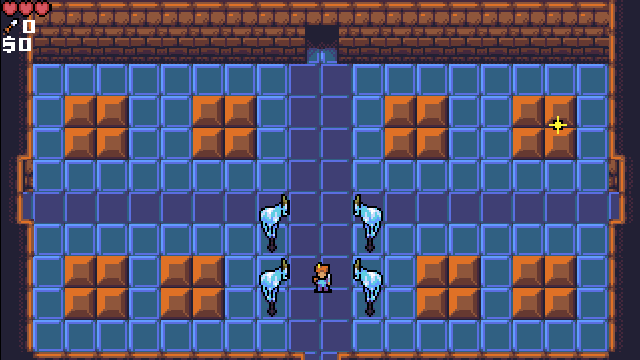 The Other Adventurer is a short action RPG in the style of the original Zelda, made at TOJam 12. 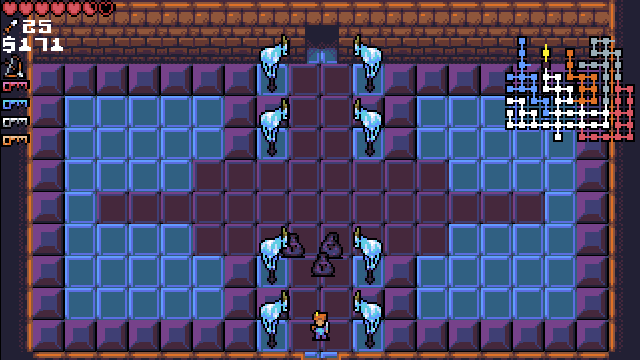 You must explore a dungeon maze and collect the four elemental keys to unlock your path into the lair of the final boss and save the princess. The jam's theme was "Prepare For Disappointment," which should explain itself as you play the game. My guess is about an hour to beat. Saving/Loading can be done by going to the screen to the south of the starting screen and moving over the save/load section for the three save slots. The game places the player initially in an opening area with lots of green enemies that die in one hit, and dead ends to the north and east. 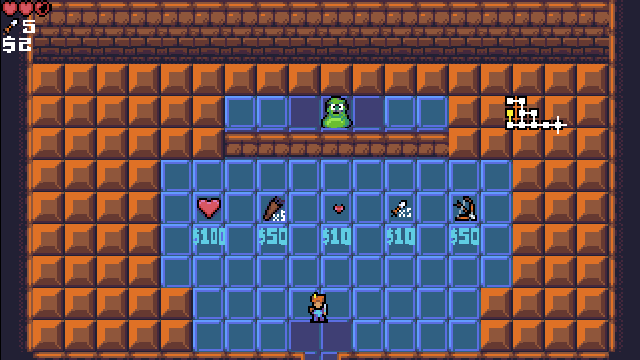 The combat is a smoothly implemented action based system - hit space to stab, ctrl to shoot your bow (when you have it) if an enemy bumps into you it hurts. 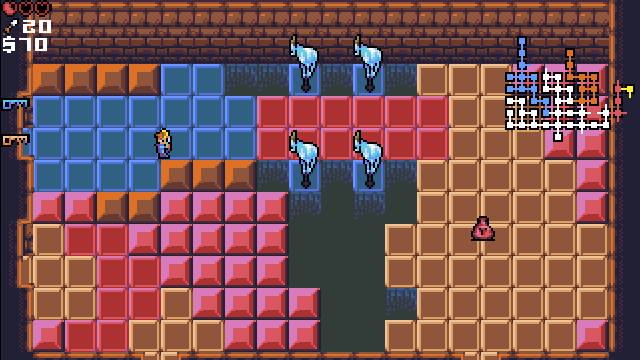 To the west is the way to go to both find useful items and a switch to remove the dead ends, the player then finds 4 different coloured areas each of which contains a key, to get the key from each area requires walking in a large circle to hit switches in the right order each switch blocks one route and opens another - each area seemed to require backtracking several times to hit the switches correctly. 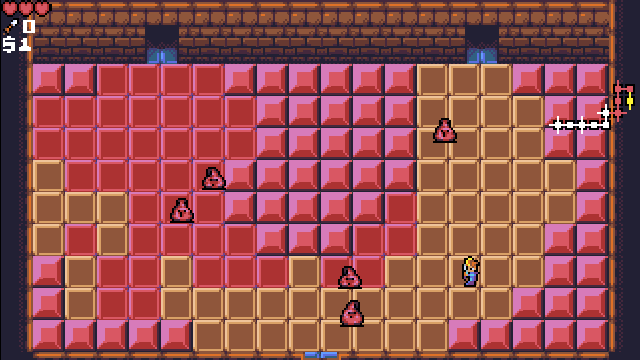 Note throughout each of these areas there are enemies coloured for that area which take a few more hits to kill. Hm, somehow I didn't know about that function. Go figure! I was going to mention it, but I forgot. 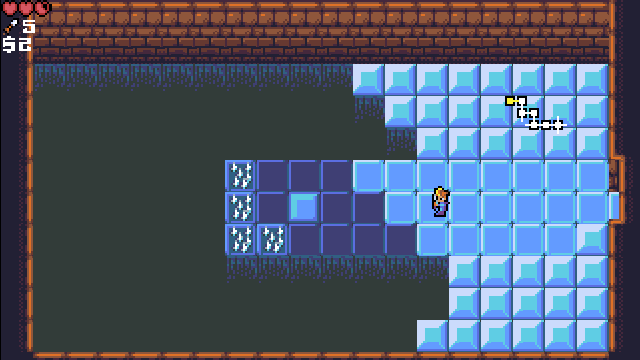 I've done it a bit before in order to do things like 2x+ scale factors, though the scaling of the tiles isn't that good at times (depending on the driver). Question for you Beaker: how much of this game's engine (map handler, movement, combat etc) did you write in the 3 days? If you did all of that as well as making the maps that is insanely impressive. All the code was written from scratch starting at the beginning of the jam. It came to about 2500 lines, the same as RRRP, but I felt like I got a lot more done this time around since I was able to do other things besides mainly coding during the jam, like I felt I did with RRRP. There's 80+ maps in the game, which is an improvement over GaMc, which had more like 40. You do three day game jams for ten years, you get good at getting stuff done in those three days.